Kimberley Koz, Writer Inpurr-rupted: Some girls carry purses. I carry cats. Some girls carry purses. I carry cats. 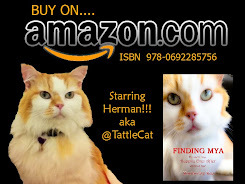 Everyone loves a happy twist to a homeless stray story. 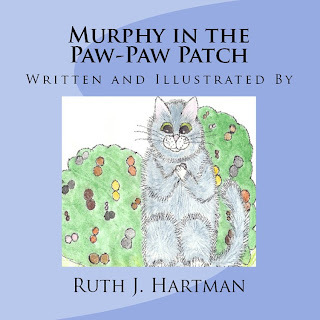 I'm so happy my new friend, author Ruth J. Hartman, has one to share. I have always loved cats. And they have always loved me. For those of you who know cats, you know it has to go both ways to work. Most every picture of me growing up, I’m holding at least one cat. Some girls carry purses. I carry cats. Like right now, Maxwell is napping on my lap. Eyes shut, pretending to be asleep. Afraid if he looks at me, I’ll boot him off my lap. Not that I would do that. Only in dire emergencies. I have to use the bathroom. My legs are asleep. I need some chocolate from the fridge. You get the idea. Maxwell doesn’t have much to worry about. He’s loved and protected. If he only knew what I saved him from. Four years ago, he showed up at our house. Cold. Wet. And loud. We’d had only one cat for years. Baxter. I knew Baxter wouldn’t be crazy about having a brother. But I couldn’t let Max stay outside to die. I just couldn’t. He was so skinny, you could see all his ribs through his fur. And he developed a huge abscess on his cheek. 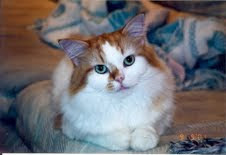 Once at the vet, they tested Maxwell for feline leukemia. Yep. He had it. Their recommendation was to euthanize him. I argued that Baxter had gotten the feline leukemia vaccine for years. Not because he went outside. But because there’d be times when he would sit in the open windows in the summer. The only thing separating him from the outside feral cats was a thin screen. The vet said the vaccine wasn’t 100%. My husband and I talked it over. We decided to take a chance. Max, now fat and sassy, is healthy and happy. Living like a chubby king with his sister Roxy. She also gets the vaccine because of Max. She showed up much like he did. Alone. Scared. Wanting nothing more than to be a part of a loving forever home. 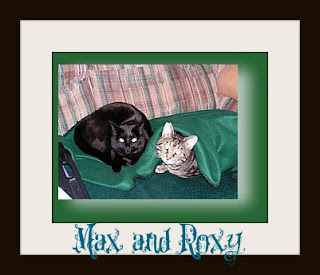 Baxter, our original cat, died the year after we got Roxy. He’d always had health issues, so we only got to have him for eight years. But he was loved. Oh, how he was loved! Garry and I don’t have any children, so my cats are my kids. I was glad to have two other cats when Baxter died. It was so hard, letting him go, but I had the love and comfort of the other two. It was then I decided I would always have at least two cats. 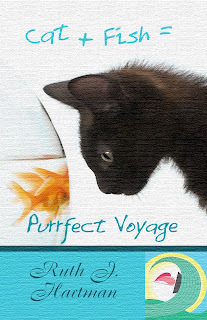 Because coming home to an empty, catless house is simply unthinkable. 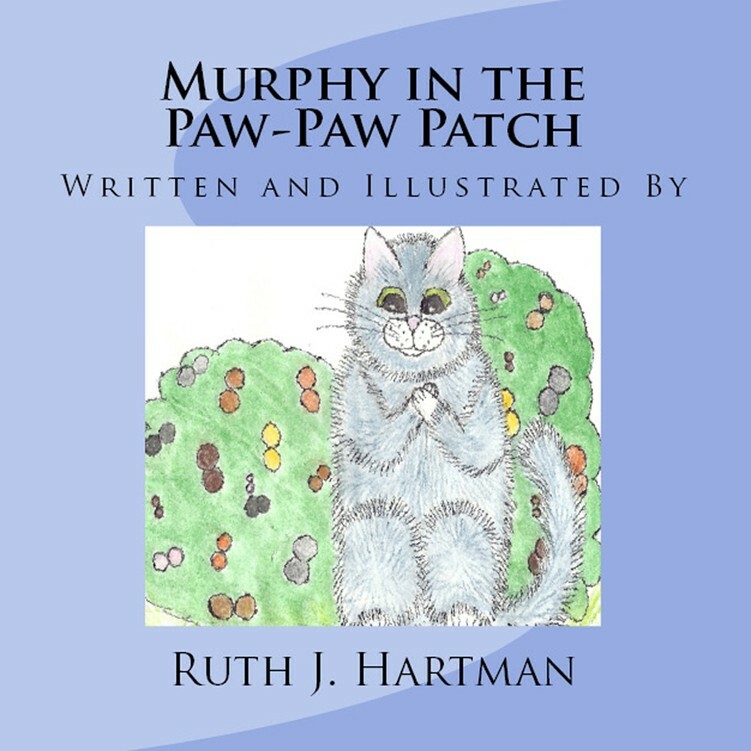 Author Ruth J. Hartman spends her days cleaning teeth, and her nights spinning sweet romantic tales that make you giggle, laugh, and all-out guffaw. She, her husband, and their two cats, love to spend time curled up in their recliners watching old Cary Grant movies. Well, the cats, Maxwell and Roxy, sit in the people's recliners. Not that the cats couldn't get their own furniture. They just choose to shed on someone else's. You know how selfish those little furry creatures can be. Ruth, a left-handed, tooth-scraping, Jeep driving, farmhouse-dwelling romance writer uses her goofy sense of humor as she writes tales of lovable, klutzy women and the men who adore them. Ruth's husband and best friend, Garry, reads her manuscripts, rolls his eyes at her weird story ideas, and loves her in spite of her penchant for insisting all of her books have at least one cat in them. Or twelve. But hey, who's counting? What a cool profile! I understand why those kitties showed up there! It was meant to be. =) I only have one cat now, but I intend on getting a second in the next couple years for the same reason. I wouldn't be able to bear losing her and have no one left.